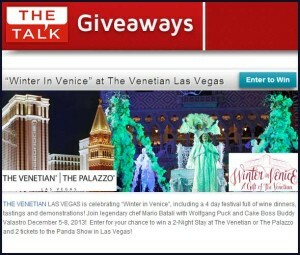 Enter The Talk Giveaway today and win a trip to Las Vegas! Want to head to The Venetian in Las Vegas? 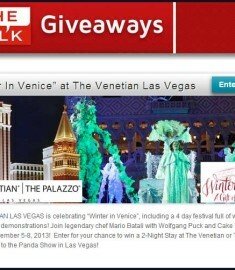 The Venetian is celebrating the ‘Winter in Venice” festival and you could be there! Do not miss out on this awesome win a trip sweepstakes and make sure you enter before the closing date of November 25th, 2013. The The Venetian in Las Vegas, NV is celebrating “Winter in Venice”, this includes a 4 day festival full of wine dinners, tastings and demonstrations! You could be the lucky winner and join the legendary chef Mario Batali with Wolfgang Puck and Cake Boss Buddy Valastro December 5th-8th, 2013! Enter now for your chance to win a 2-Night Stay at The Venetian or The Palazzo and 2 tickets to the Panda Show in Las Vegas! I love Las Vegas the fun, the gambling, the food and drink! Would you like to head to Sin City for a wild time in 2014! Is life a little lackluster at the moment? Stuck in a rut? Well a 4 night trip to Las Vegas would surely sort it out. Hopefully it won’t turn into scenes from ‘The Hangover” or worse “Fear and Loathing in Las Vegas” but I am sure you can find a way to let your hair down! Day time TV is Jam packed with TV giveaways, that is why I stay tuned in to find them all for you! The Talk Giveaway is a prime example of why watching TV is a great thing! (I am sticking to ‘its my job’ excuse!). I’m want win the trip because my husband and me had not Honeymoon. We have 8 mouths of marriage.